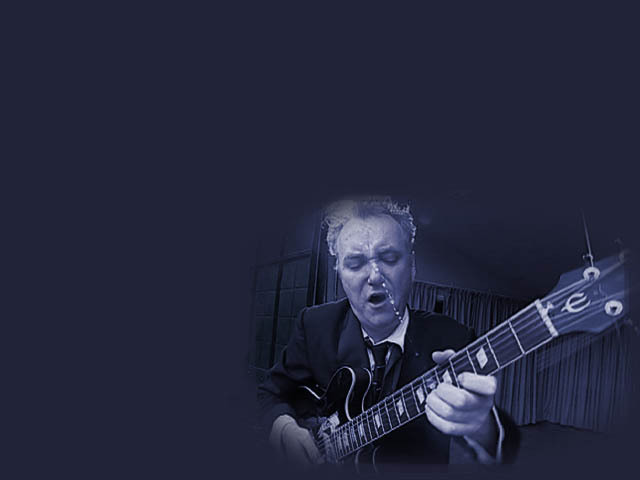 Billy Jenkins, London’s Blues guitarist extraordinaire has been videoed! Yes indeed. Singing and playing his very own brand of dark suburban, poignantly observed, Bluesy tunes, Billy Jenkins With The Blues Collective have been captured in all their live glory in front of an appreciative home crowd. It’s summer in Central London. It’s lunchtime. It’s a free gig! Sandwiches and coffees for the audience. Bananas for the band?! With his pleasantly skewed view of life’s trials and tribulations, Billy delivers a Tour de Force performance with equal measures of tickling and stabbing for the audience, the band and his guitar. In contrast to Billy’s antics, The Collective work a well-honed ruse of dead-pan stage presence while they get on with very tight ensemble back-up playing; brilliant solo work from Dylan Bates on violin, and Richard Bolton on guitar. Thaddeus Kelly and Mike Pickering hold the fort on bass and drums respectively. Philip Vallentin, long time UK resident of Canadian extraction and Director and Producer of animated films thought it was high time that Billy and the band were captured on video for the world’s viewing pleasure. After dismissing many venues as unsuitable, both Billy and Philip thought that the ‘Al Fresco’ nature of this fixture would be the perfect occasion to see Billy tell it like it is, and to ensure the actual filming didn’t interfere with the audience’s enjoyment of the gig. For more information on Billy, click www.billyjenkins.com.